May 3: Free choice I loved Elizabeth Abraham’s New Year’s Resolution for a year of LIGHT. 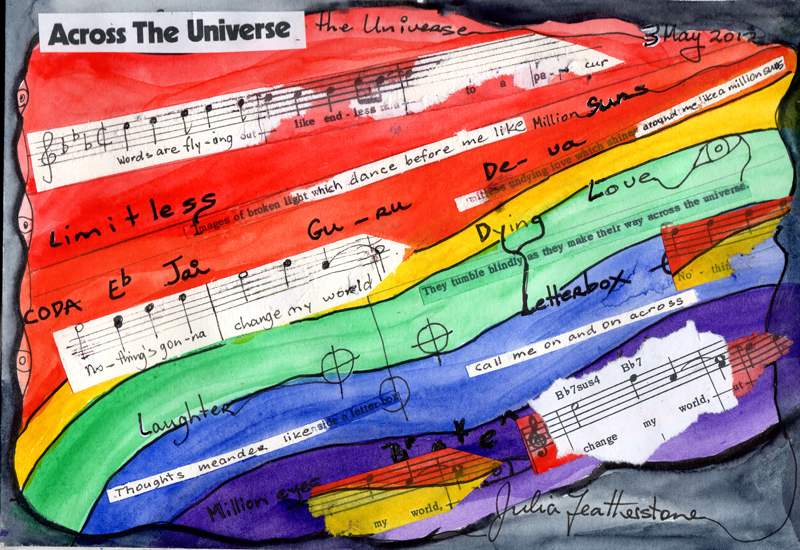 I remembered that my word for 2012 is MUSIC, especially lyrics, invisible electro-magnetic waves and colour. Thanks Elizabeth! I listened to John Lennon singing “Across the Universe” as I tried to respond to the music and lyrics within the electromagnetic waves… I found it poignant that he kept repeating “Nothing’s gonna change my world” and of course his world changed dramatically. This led me to rip and tear the lyrics to distort memory and hope.